In my short post about Monday’s announcement of the detection of a pair of coalescing neutron stars (GW170817), I mentioned that one of the results that caught my eye in particular was the paper about using such objects to determine the Hubble constant. You can also see latest determinations from other methods, which appear to be in (slight) tension; you can read more about this here. Clearly the new result from GW170817 yields a fairly broad range for H0 but, as I said in my earlier post, it’s very impressive to be straddling the target with the first salvo. In in the paper, Bernard points out that a binary coalescence — such as the merger of two neutron stars — is a self calibrating `standard candle’, which means that it is possible to infer directly the distance without using the cosmic distance ladder. The key insight is that the rate at which the binary’s frequency changes is directly related to the amplitude of the gravitational waves it produces, i.e. how `loud’ the GW signal is. Just as the observed brightness of a star depends on both its intrinsic luminosity and how far away it is, the strength of the gravitational waves received at LIGO depends on both the intrinsic loudness of the source and how far away it is. By observing the waves with detectors like LIGO and Virgo, we can determine both the intrinsic loudness of the gravitational waves as well as their loudness at the Earth. This allows us to directly determine distance to the source. Above all, congratulations to Bernard for inventing a method which has now been shown to work very well! This entry was posted on October 19, 2017 at 12:49 pm and is filed under The Universe and Stuff with tags Bernard Schutz, Cardiff University, gravitational waves, GW170817, Hubble constant, Neutron Stars. You can follow any responses to this entry through the RSS 2.0 feed. You can leave a response, or trackback from your own site. On the other hand, probably more work went into LIGO than all previous work on the Hubble constant combined! Wow. As a self-calibrating standard candle, such mergers are a bit like a Cepheid variable, is that right? Is Bernard the new Henrietta Leavitt? Cepheids aren’t self-calibrating. The absolute luminosity is known since distances to some Cepheids are known from parallax etc. So they are calibrated but not self-calibrated. Leavitt discovered the period-luminosity relation for Cepheids on the basis of apparent magnitude, not absolute magnitude. This was possible since, because they were all in the Small Magellanic Cloud, they were all at approximately the same distance, so the observed relation between apparent magnitude and period implied one between absolute magnitude and period. Presumably, one could calculate the absolute magnitude theoretically, from first principles of stellar structure and evolution, but as far as I know this isn’t possible, at least not to interesting accuracy and/or precision. Note that “self-calibration” has a rather different meaning in radio astronomy. Doesn’t this observation also use the EM counterpart and not exclusively with GW information alone? Yes, but that doesn’t matter for the self-calibration aspect. 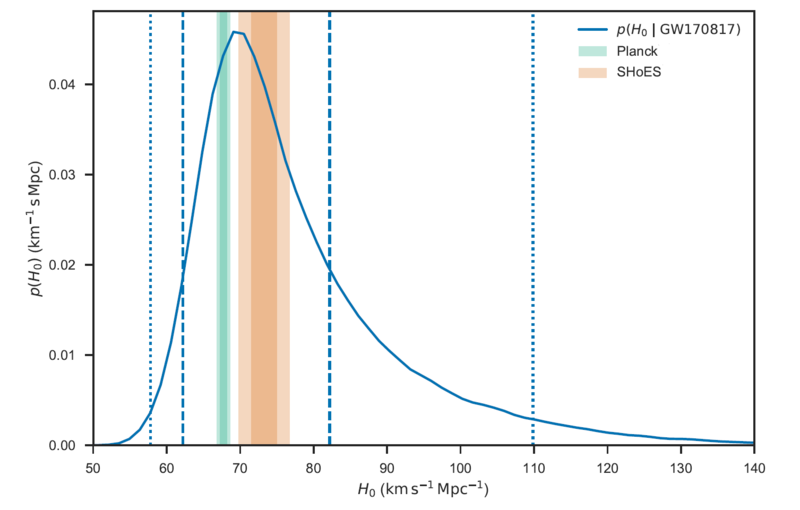 To measure the Hubble constant you need a distance and a redshift. The GW observation gives you the distance. But does it also tell you the redshift? Or do they need to spot the optical counterpart for that? Do gravitational waves get redshifted by cosmic expansion the same way as light does? Does this introduce some degeneracy with the self-calibration (using the frequency of the gravitational waves to determine the intrinsic loudness of the merger)? Hmmm my data and stats is a bit rusty here but shouldn’t they perform a logarithm on that graph to try and remove some of that right skewness? In response to Alex, Yes GW’s also get redshifted as the medium through which they travel undergoes the same expansion that affects EM radiation (presumably some form of quantum field). Good question regarding the impact of frequency redshift on the accuracy of the Amplitude calculations. I think we need to read Bernards Schultz paper to know for sure, but let me take a run at this. Basically, we know that the Energy of a Wave is proportional to its Amplitude squared (From memory this is derived from looking at complicated wave equations of the kinetic and potential energy of points in a standing wave, but would appreciate a source from others). We measure the amplitude of the GW at earth, and we make an estimate for the intrinsic amplitudes using the Frequency of the binary orbit (Schultz). However, that frequency is also red-shifted as Alex mentions above. I find this hard to justify as if they are using the red-shift data from EM sources this does not make the GW estimates of H0 independent from the EM measurements made to date. More reading has turned up a paper by Del Pozzo where he outlines how H0 can be estimated to approx ~5% without any optical counterparts at all (just by looking at multiple GW sources).